Doctor Frederick Banting: Visionary scientist, researcher and… artist? Banting’s discovery of insulin came to define his life and career, and although it was his best-known accomplishment, it was certainly not his only one. This week, I have been researching Banting’s artwork to create an online map of his travels, and I find myself constantly surprised by his many achievements. As a young doctor with a struggling medical practice in London, Banting began to spend his idle hours painting. What started as a simple hobby soon became a passion. Later on in Toronto, he became close friends with the iconic Group of Seven, in particular A. Y. Jackson. He began to gain artistic merit as his talent grew. With Jackson, he travelled all across Canada on sketching trips, particularly to Quebec and the Arctic. His fascination with the vast, lonely reaches of the north made him appreciate his home country of Canada. For Banting, the pursuit of good art was like the pursuit of good research: both were, in their own ways, a quest for an undeniable truth. As he grew older, his artwork began to influence the way he lived his life more and more. As he wrote in his journal on one trip, “The more I think of the city the more I want to live in the country, and the more I think of being a Professor of Research the more I want to be an artist”. The more I read of Banting’s journals, the more I see him in a different light – a dedicated artist with a fierce love for his country. 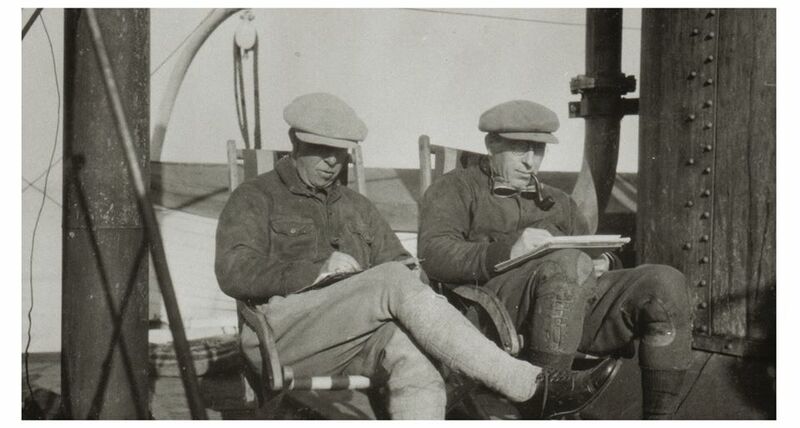 Banting (R) and A. Y. Jackson sketching in the Eastern Arctic, 1927. At the museum, we have a number of paintings and sketches by Banting. While some earlier works are amateur, by the 1930s, they are vivid and full of rhythm and colour, showcasing the height of Banting’s creativity as an artist. Researching these paintings and reading the journal of the man who created them have given me an entirely different perspective on him. Frederick Banting was so much more than insulin – he was a man of many talents, and his paintings prove that. Posted in Behind the Scenes at Banting House.